The Virtual CS is the default configuration when no other interface is defined. This library prevents confronting the novice user with communication issues at first start, and is a tool for testers and developers to 'run' without damaging loco's. Sensor emulation with optional timed reset. Extended traces for addressing for all methods. CV read generate a random number in the range of 0…255. A booster statistics reset will trigger random generated values. A stress runner to test the monitor messaging throughput. Timed commands for resetting the switch motor output. A random sensor event generator. Don't forget to give the sensors an address, otherwise Rocrail goes wrong in the simulation mode. For normal use no setup is needed. Activate the Sensor Reset option. 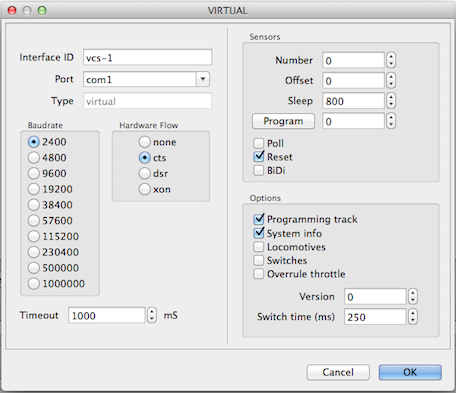 The activation of the option simplyfies tests with virtual CS; Sensors need only one click for activation and reset themselves after given sensor sleep time. A manual reset of the sensor is not necessary. The sensor sleep, in ms, is used for the timing of the reset. The default of 200ms is very short; Recommended are the max. value 1000ms. For test of manual set of route by means of outputs (example here Using outputs to set routes) the option “Reset” must be deactivated. A server restart is needed to activate. If the "Overrule throttle" option is set field events will be generated for speed and function commands. If the Version is set to 2 the sensor generator will be started after restart and power on. With a power off command the generator will pause. Sensor addresses are picked randomly. The frequency of generating events is 1 second. The sensor offset is added to the generated random address. The timeout value is used as interval; Default 1000ms. A random CV get value will be generated in case this option is set. Otherwise the previous CV set value will used for CV get. CV get values will be send twice to emulate Railcom POM decoders. This option is for developers only In all other cases: Leave this field to zero. 1 1000 random sensor events at SoD. 3 Outputs are reported in MADA addressing scheme. 4 Do not echo switch and output commands.